While the scores of sessions conducted over the course of the 2016 ASCB Annual Meeting resonated with the meeting’s theme, “Following the Arc of Scientific Discovery,” the common message woven throughout the five days was one of newfound microscopic insight. Breakthroughs in imaging are showing biologists for the first time cellular functions about which we previously could only hypothesize. New types of fluorescent tags as well as enhanced forms of microscopy hardware are shedding light at the millionths of a meter scale in what has become known as nanoscopy. Lattice light sheet microscopy now can record up to 1,000 frames per second at resolutions as small as 230 nanometers, letting researchers physically watch everything from how viruses enter cells to how they change size and shape as they divide. Super-resolution imaging involves an increasing number of new methods, such as PhotoGate, and brings an alphabet soup of terminology into play. STED, STORM, iPALM, MINFLUX, and cryo-EM all were credited in various presentations, posters, and workshops with allowing researchers to peer ever closer at how life works at a molecular scale. So varied are the new methods that even the two-hour workshop “Cell Imaging in the 21st Century” could only scratch the surface of how we can now image faster, more sharply, more gently, in more colors, and in more detail than ever before. Of course, it’s not quite that simple. The laws of physics tend to get in the way. When two things get closer together than about 200 nanometers, they can’t be distinguished using traditional microscopy. Instead, the two objects appear as one blurry blob because of light’s diffraction limit, also known as the Abbe limit. Now, though, an imaging method called DNA-PAINT allows fluorescence to highlight far smaller objects such as enzymes and receptors. So-called “imager strands” tag small pieces of DNA with a fluorescent dye that then binds periodically to a matching DNA strand on a target molecule. That binding makes the target appear to blink, which turns what once was a blur into discrete pinpricks of light. Janelia chemists have worked out how to improve the brightness and photostability of such fluorophores. The new compounds, available to researchers free of charge, are creating opportunities for sophisticated multi-color imaging within living cells, including single-molecule tracking. Creating the more intense fluorophores is one thing. Actually using them to image molecular structures inside living cells at isotropic resolution is another thing altogether. That’s where a smorgasbord of new microscopy techniques has helped to extend the reach of fluorescence microscopy over the last few years. Methods such as stimulated emission depletion microscopy (STED), stochastic reconstruction microscopy (STORM), photo-activated localization microscopy (PALM), and structured illumination microscopy all are capable of resolving structures as small as 50 nanometers across. But work continues to push those resolutions even more. Using deformable mirrors and adaptive optics borrowed from astronomy to reduce depth distortion, Peter Kner’s team from the University of Georgia has been combining different super-resolution techniques to image model organisms, including Caenorhabditis elegans and zebrafish. 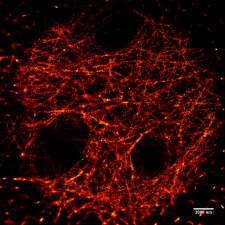 New lattice light sheet microscopy, just introduced in October 2014, is taking things a step further. Because it can collect high-resolution images rapidly while minimizing the cell damage caused by intense light exposure, researchers can do such things as track the movements of individual proteins and watch the rapid swelling and snipping off of cytoskeletal components in dividing cells. Traditional 3D microscopy techniques “torture” a cell to death, noted Hari Shroff from the National Institute of Biomedical Imaging and Bioengineering. But light sheets prevent damage to any particular point of a specimen and allow researchers to gather and consolidate different angles of view of rotating subjects. While the new techniques are producing unprecedented molecular “movies,” Shroff said nanoscopy also is creating what he called “the big data problem.” Now that scientists can collect 100 terabytes of digital information in a single image in a single day, research is teetering on the edge of information overload. Shroff urged his colleagues to collaborate with computational experts who can guide biologists on the myriad ways they might analyze and learn from such massive amounts of data. Conditions inside a cell, including crowds of individual molecules, can flout the best efforts of modern imaging technology to observe their activity. And that’s not to mention the fact that cells become unhealthy and die during time-lapse imaging. So Vladislav Belyy and his biophysics colleagues at the University of California, Berkeley, sought to overcome some of these issues as they developed their new PhotoGate microscopy technique, which Belyy introduced Monday at the Microsymposium on spatial organization of the cell. Using a pair of lasers, the PhotoGate technique involves pulsing one laser as a gate beam to sweep outwards from the center of a region of interest, creating a photobleached circular area. That laser then is shuttered for several seconds to let a few unbleached molecules diffuse back into the area. The second laser, called the imaging beam, is used to image fluorescent molecules in the area. To prevent too many fluorescent molecules from diffusing back into the region, the gate beam sweeps repeatedly along the region’s outer perimeter. 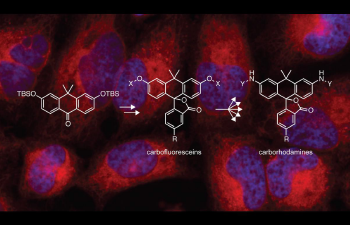 The Lavis lab at HHMI’s Janelia Research Campus has developed carbon-containing analogs of fluorescein and rhodamine to create a new high-contrast scaffold for fluorogenic molecules. Ultimately, though, researchers would like to peer inward to the atomic level. We’re nowhere near that yet, but imaging specialists believe the most likely path there involves cryo-electron microscopy, or cryo-EM. With this technique, researchers submerge thin samples into ethane baths cooled to –180°C, flash-freezing the biological material so it can be bombarded with electrons. There are two primary types of cryo-EM: single-particle analysis and cryo-electron tomography, or CET. Despite its name, single-particle analysis requires taking massive numbers of 2D images of the same kind of biological object and then applying image-processing algorithms to superimpose those images into a 3D structure. CET, however, requires capturing multiple images of the same object, tilting it to construct a 3D representation. CET’s resolution is lower than single-particle analysis, but it can be used on organelles or even entire cells. Experimentation lately has tended to use both methods in concert. Recently, new algorithms for analyzing multiple images and new, extremely sensitive cameras called direct electron detectors have made cryo-EM more powerful. Biologists now are pushing the technique further to image even more detailed structures. University of California, Berkeley, structural biologist Eva Nogales, who delivered the Keith R. Porter Lecture on Sunday, leads a team that used cryo-EM to study a complex that orchestrates the transcription of DNA into RNA. The group was startled to find a 100-angstrom arm that swings around the DNA strand like a crane, possibly influencing whether a gene is transcribed. Why use only one technology when two gets you better understanding? Justin Taraska from the National Heart, Lung, and Blood Institute of the NIH discussed how fluorescent microscopy and electron microscopy combined can produce images beyond the reach of either technology alone. Called correlative light electron microscopy, or CLEM, the hybrid technology permits the whole-cell imaging of an optical fluorescence microscope alongside the molecular-level resolution of an electron microscope. In an integrated CLEM system, the sample is imaged using an electron beam and an optical light path simultaneously to obtain information at different scales, Taraska said. The electron microscope provides high-resolution images down to the nanoscale, while the fluorescence microscope highlights the regions of interest. As ASCB 2016 concluded, researchers discussed additional innovations expected soon in super-resolution imaging. With each advancement building on the previous one, biologists continue to glean deeper understanding of the cell as their view into its inner workings magnifies.